Author(s): Imran Ali, Department of Chemistry, Jamia Millia Islamia (Central University), New Delhi-110025, India. Jabeen Abbasi, Zeid A. ALOthman, Abdulrahman Alwarthan. Background: The examination of cardiovascular drugs is very imperative in human beings. For this, the sample research is very crucial prior to analysis as these drugs are in attendance at low amounts in human plasma. Introduction: Low-cost solid phase micro membrane tip extraction and high performance liquid chromatographic methods were offered for examining propranolol, aspirin and atorvastatin in human plasma. Method: Green production of iron nano composite sorbent was obtained efficiently with 90% product. The surface showed of uneven features of the nano particles. The produced iron nano composite sorbent was used in solid phase micro membrane tip extraction. 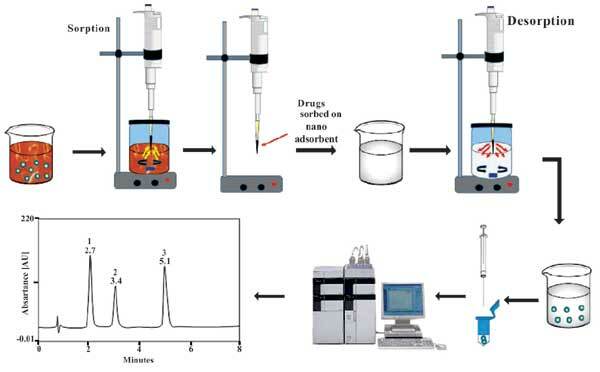 The examination of propranolol, aspirin and atorvastatin in human plasma was done using solid phase micro membrane tip extraction high performance liquid chromatographic and methods. Results: New generation C28 stationary phase was exploited with phosphate buffer:acetonitrile (30:70, v/v; pH 3.0) as eluent. 1.0 mL/min was marinated as flow of eluent with detection at 236 nm. The extent of retention factor was 1.70, 2.40 and 4.30. The separation and resolution factors extents were 1.41 & 1.81 and 1.40 & 3.80, respectively. The peaks were sharp with base lined resolution. The percentage recoveries of propranolol, aspirin and atorvastatin in standard and plasma samples were 90.5, 90.0 & 37.0 and 17.5, 16.0 & 7.0, respectively. Conclusion: The produced solid phase micro membrane tip extraction high performance liquid chromatographic and methods were reproducible, quick, exact, tough, rough and fiscal for the examination of propranolol, aspirin and atorvastatin in human plasma. Keywords: Nanocomposite adsorbent, propranolol, aspirin, atorvastatin, new generation C28 column, human plasma, SPMMTE. Affiliation:Department of Chemistry, Jamia Millia Islamia (Central University), New Delhi-110025, India. Keywords:Nanocomposite adsorbent, propranolol, aspirin, atorvastatin, new generation C28 column, human plasma, SPMMTE.